Albuquerque, NM is full of rich culture and beauty, not to mention 55+ communities perfect for the active lifestyle. Albuquerque is the largest city in New Mexico and is popular for its beautiful desert landscape and rich multicultural history. 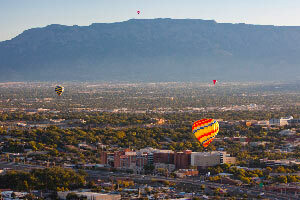 It is also home to the famous International Balloon Fiesta, the world’s largest hot air balloon event. Albuquerque has a great mix of urban attractions and southwestern charm thanks to the city’s modern downtown skyline set against the majestic Sandia Mountains. Located amid the Sandia and Manzano Mountains, there is plenty of natural beauty and recreation for nature lovers. The Albuquerque metro area also has a vast population of almost one million residents with approximately a quarter of them aged 55 and better, making it an ideal retirement destination. Albuquerque is known for its dry, sunny climate and beautiful outdoor scenery. Although the city has four different seasons, retirees can still enjoy about 300 sunny days per year. The city is located in the northern tip of the Chihuahuan Desert and usually receives only about eight to nine inches of precipitation per year. In the Valley, winter temperatures range between high 50s and low 20s while summer temperatures stay around 90 degrees during the daytime and drop to mid 50s in the evenings. The Sandia Mountains run along the eastern side of the city and the Rio Grande flows right through the downtown. Albuquerque has one of the highest elevations of any major city in the country, making the air thinner than at lower elevations. Glenwood Hills and Sandia Heights are located in the foothills of the Sandia Mountains and are over 6,700 feet in altitude. Cities located around the Valley area and near the Rio Grande have altitudes less than 5,000 feet. The Albuquerque area is immersed with vibrant art and rich culture. Throughout the city, active adults will find colorful murals painted along highway overpasses and retaining walls as well as decorative sculptures. Retirees will find numerous museums that range from ancient history to modern art. Old Town, a historic downtown area of the city dates back to the 18th century, offers retirees a mixture of commercial districts, distinct neighborhoods, historic adobe buildings, and the San Felipe de Neri Church, a Spanish colonial church that was built in 1793. The stunning Sandia and Manzano Mountains provide the perfect outdoor environment for Boomers who love to hike, bike, or rock climb. During the winter months, these mountains also provide great powder skiing. The city has plenty of walking trails that are great for exploring the natural scenery via foot or bicycle as well. The area is also home to more than a dozen top-notch golf courses set against beautiful backdrops and natural views like rocky mountain peaks and streams from the Rio Grande. One of the most popular attractions in Albuquerque are the hot air balloon rides and events that soar up to the city’s blue skies. Albuquerque is the hot air ballooning capital of the world and offers the best weather conditions year-round for balloon flights. In October, the city welcomes people from all over the world for its largest gathering of hot air balloons for the International Balloon Fiesta. For a more relaxed vibe, Boomers will love the area’s shopping and dining options. The city features an eclectic mix of flavors and styles as well as modern and old such as traditional New Mexican restaurants, craft breweries, wineries, cafes, American diners, and intimate bistros. The Albuquerque area includes cities like Los Lunas, Rio Rancho, Belen, Bernalillo, and Placitas. Retirees will find a wide selection of 55+ communities throughout the region that feature low-maintenance homes, resort-style amenities, and exciting social environments. Some of the most popular 55-plus communities include Jubilee at Los Lunas, which is a 700-home community just 20 miles south of Albuquerque that features world-class amenities and well built homes set against the a stunning backdrop of the El Cerro de Los Lunas Mountains. Retirees looking for new construction will find that and much more at Del Webb at Mirehaven. This new 55+ community opened in 2015 and will host just 538 single-family homes at build out. Another great active adult community is Del Webb at Alegria in Bernalillo, NM. This age-restricted community has only 376 homes and provides retirees with a close-knit neighborhood vibe along with well-appointed amenities and plenty of activities that promote an active and social lifestyle. With a great selection of active adult communities along with the urban amenities of a large city combined with natural beauty and outdoor recreation, retirees are sure to choose Albuquerque, New Mexico for their retirement destination.